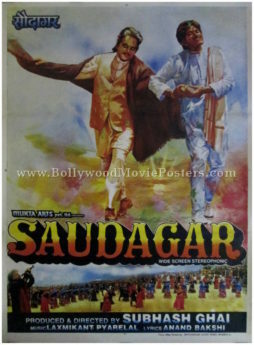 Classic Bollywood film poster of the super hit Hindi movie Saudagar (1991) for sale. 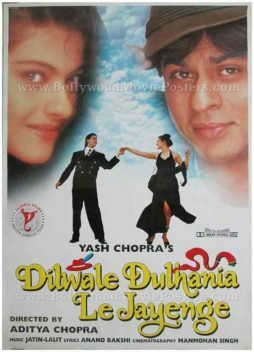 This is an actual surviving classic Bollywood film poster of the 1991 Hindi movie that starred the ultimate method actor of Bollywood, Dilip Kumar in the lead role. Directed by Subhash Ghai, Saudagar also featured Raaj Kumar, Manisha Koirala and Vivek Mushran in pivotal roles. 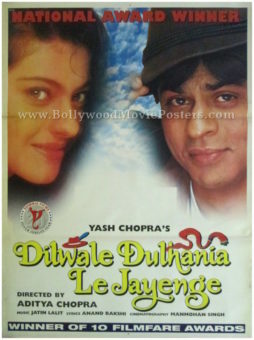 Printed and circulated during the original first release of the film (early 1990s), this Saudagar poster was designed for publicity of the film but never ended up being used. 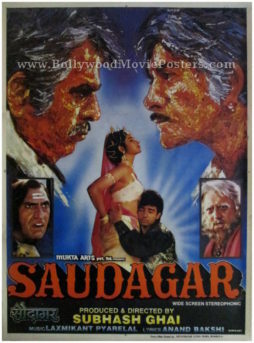 Saudagar was a hit and crossed the silver jubilee mark, winning director Subhash Ghai his only Filmfare Best Director Award; making this Dilip Kumar film poster highly collectible! The two veteran stars of the film, Dilip Kumar and Raaj Kumar are seen in a brilliant hand painted rendition on the top. Their full figure portraits are seen painted amidst a riot of colors and the camaraderie between them is very evident. 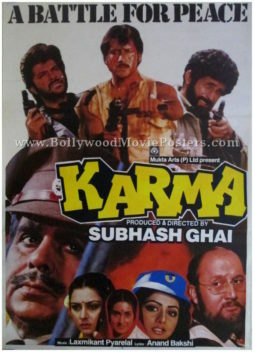 A smaller photographic still taken from a song in the movie is seen at the bottom of this Dilip Kumar film poster. The soundtrack of the film became very popular upon its release. Songs like “Ilu Ilu” and “Imli Ka Boota” are fondly remembered till today. 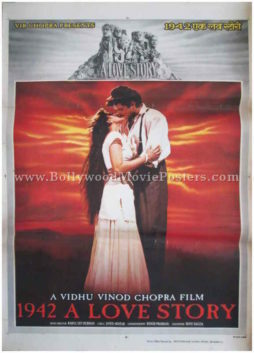 Classic Bollywood poster of the super hit Hindi film Saudagar (1991) for sale. 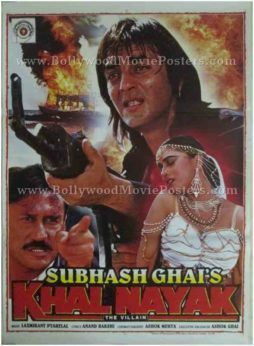 This is an actual surviving classic Bollywood poster of the 1991 Hindi movie that starred the ultimate method actor of Bollywood, Dilip Kumar in the lead role. Directed by Subhash Ghai, Saudagar also featured Raaj Kumar, Manisha Koirala and Vivek Mushran in pivotal roles. 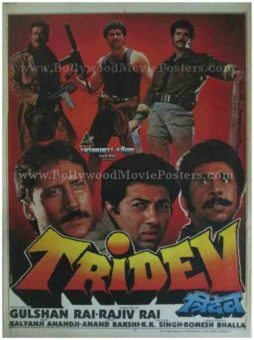 Saudagar was a hit and crossed the silver jubilee mark, winning director Subhash Ghai his only Filmfare Best Director Award; making this Dilip Kumar movie poster highly collectible! The two veteran stars of the film, Dilip Kumar and Raaj Kumar are seen in a brilliant hand painted rendition on the top. Their side profiles bearing stern expressions are facing each other, suggesting enmity between the two. Younger stars Manisha Koirala and Vivek Mushran are seen in a dancing pose at the bottom of this Dilip Kumar movie poster. 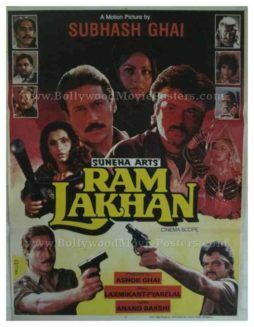 Smaller photographic stills of Amrish Puri and Anupam Kher are seen at the bottom. 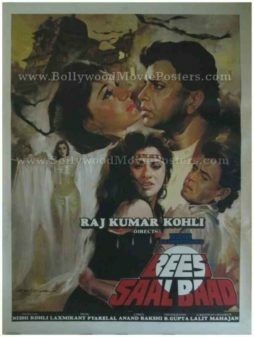 The textured, knife painted brush strokes on the large side profiles on the top give this Dilip Kumar movie poster a very artistic feel. 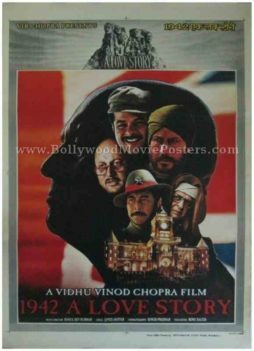 Classic Bollywood movie poster of the super hit Bollywood film Saudagar (1991) for sale. 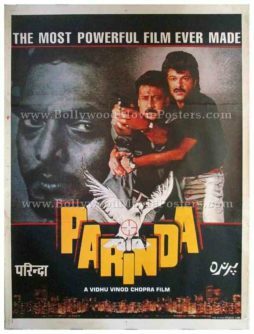 Printed and circulated during the original first release of the film (early 1990s), this Saudagar movie poster was designed for publicity of the film but never ended up being used. 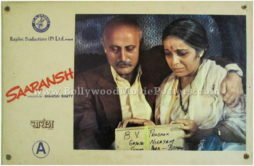 Saudagar was a hit and crossed the silver jubilee mark, winning director Subhash Ghai his only Filmfare Best Director Award; making this poster, highly collectible! The two veteran stars of the film, Dilip Kumar and Raaj Kumar are seen in opposing photographic stills on the top. Younger stars Manisha Koirala and Vivek Mushran are seen in a passionate pose at the bottom. 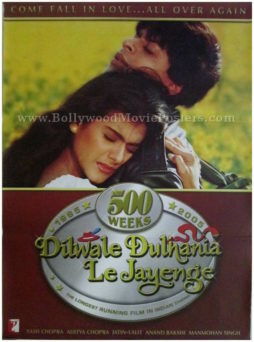 The title of this classic Bollywood movie poster appears in a interesting rotated vertical font on the left.